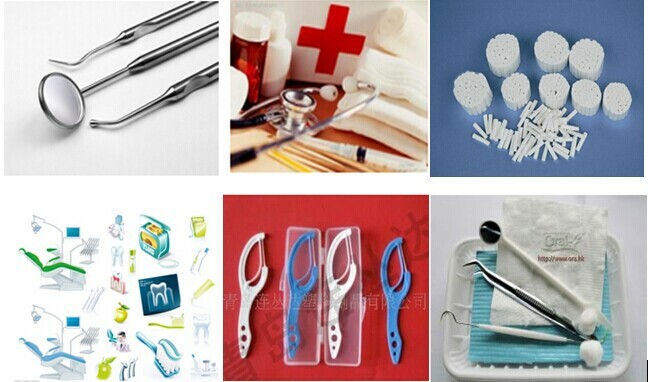 Commonly used oral inspection equipment: light curing equipment;Ultrasonic root canal treatment equipment;Dental pulp vitality measuring instrument;Root canal length measuring instrument;Root canal treatment of gear motor;Ultrasonic/sandblasting teeth cleaning machine;Whitening instrument;Silver mercury blending mixer;Amalgam filling equipment;Silver mercury conveyor;Resin filling equipment;Adhesive/acid corrosion system;Polishing equipment;Dam instruments;Hand clean governance;Scraping apparatus;Periodontal surgical instruments;High frequency electric knife etc. Dental implants machine;Planting common instrument;Tooth extraction equipment;Electric surgical equipment;Surgical instruments.Ultrasonic knife;Saliva measuring equipment;Joint disease diagnosis and treatment equipment;First aid medicines and equipment;Negative pressure aspirator.The monitor;Tractor etc. 2. Dental probe appearance without front edge burr. 1. The forceps head two slice thickness for symmetry. 2. The tweezers for appearance is smooth, no front edge burr. 1. The scarf paper-plastic composite system should be used to prevent leakage of liquid. 2. The scarf can not have noise points, burrs, cracks and holes. 1. The joint of oral cavity mirror should be no loose phenomenon, in clinical use, the lens may not be broken. 2. The glittering and translucent and bright mirror requirements.